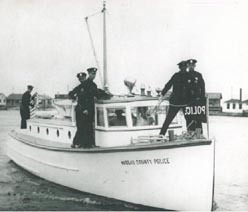 The Marine Bureau has patrolled Nassau County's 225 square miles of marine district waterways and provided marine police service for more than seventy-nine years. The Marine Bureau was established by a departmental order at the close of Prohibition during 1933, eight years after the inception of the Department. It is one of the oldest bureaus within the Nassau County Police Department, and one of the oldest police marine patrol agencies in New York State. Today, the Marine Bureau patrols county waterways aboard a fleet of modern patrol boats that range in size up to 41 feet in length. The Marine Bureau patrols 24 hours a day, 365 days a year. 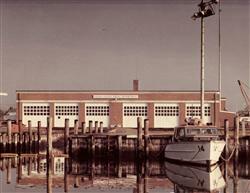 The Marine Bureau is headquartered at Bay Park, New York on Long Island's south shore. This facility is where all major patrol vessel repair work is conducted. The facility covers 15,000 square feet of space, and is located on 4 acres adjoining the waterfront. The facility may accommodate and house as many as six large patrol vessels at any one time. All major repair work to our patrol vessels is conducted at the Bay Park facility by the members of the bureau. The facility includes a marine carpentry shop, a mechanics shop, a welding and machine shop, a marine parts and equipment inventory loft, marine canvass shop, marine motor storage area, a storage area for the carry-deck crane, general maintenance bays, and administrative offices. There is a travel lift system for the haulage and conveyance of the patrol vessels. Patrol vessels are berthed and can be accessed in the adjoining boat basin which can accomodate as many as six large patrol vessels . Police personnel assigned to the Marine Bureau are all skilled and possess talents necessary for vessel maintenance, marine investigations and/or marine law enforcement training. Generally, the marine police service provided by the Marine Bureau includes enforcement, homeland security, marine assistance, E.M.S. service, search and rescue, boating accident investigation, and fire fighting on occasion. Enforcement of all laws, and particularly the Navigation Law and the Environmental Conservation Law, is vigorously pursued by the personnel assigned to the Marine Bureau. Boating safety is a priority and taken quite seriously because of the concentration of recreational boating activity in Nassau County. The Nassau County Police Marine Bureau was first established to meet the varied and growing challenges of marine law enforcement and public safety on county waterways, and it continues to provide the highest level of marine police service to the people of Nassau County.